Mix water and broth together to make a very light broth that the dogs will love. You can also just use water though. Find a sturdy four cup freezer-safe bowl or dish. Add some treats in the bottom and fill it with your broth/water mixture. Let the mixture freeze for about 30 minutes. It doesn't need to be completely frozen solid at this point. Add a thin layer of peanut butter to the top of the ice and return to the freezer for another 30 minutes. Keep adding layers of treats and broth or water until you get to four cups. You can put small toys in the ice block along with any treats. Try not to use cracker treats as they will just get mushy. Freeze the block solid for at least two hours. To unlock the ice block, just let it thaw on your counter for 5-10 minutes. It should pop right out of the container. You can also run it under warm water to release the block. DON'T do this if you used a glass bowl, as it could shatter from the sudden temperature change. 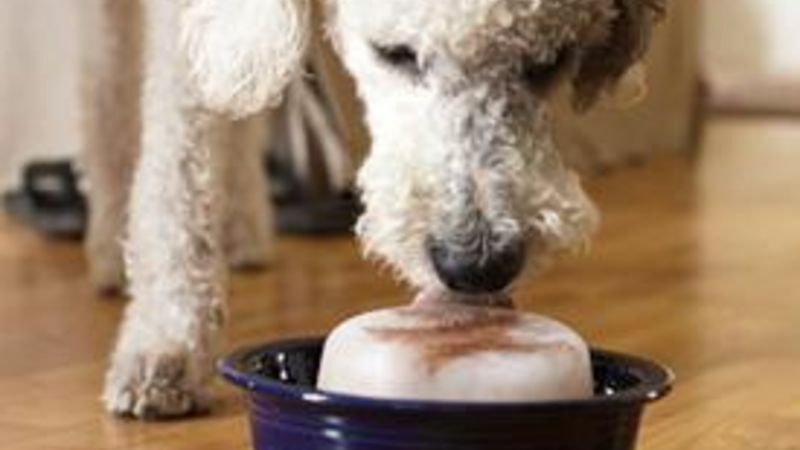 Place the ice block in a large high-rimmed bowl so the dog can reach it but it won't melt all over your floor. If your dog is hesitant to lick it, put a dab of peanut butter on the outside. Once they get the hang of it, they will love it! *For the doggy treats to include in the ice, use non-cracker-based treats such as Beggin' Strips™. Cracker treats will get mushy as the broth or water freezes. It’s so hot that even my dog doesn’t want to move from beneath the A/C vents. Sometimes we humans forget that our little furry companions can get even hotter than we are. After all, they can’t sweat so all that heat just gets trapped! To help my dog, Porter, beat the heat this week, I made him a huge frozen block of ice with a lot of his favorite treats frozen right into the block. My doggy ice treat was a huge hit! This isn’t really much of a recipe, but I’ll give you some pointers for making your own ice block treat for your dog. If you have some leftover beef broth around (low sodium is best) you can make a very light beef broth with three parts water to one part broth that your dogs will love! If you don’t have any broth, you can definitely just use water. I’ve done both methods and my dog didn’t seem to care much whether I used water or broth. As far as treats go, it’s really up to you. Just use whatever treats your dog normally eats. I wouldn’t use any kind of cracker treat. By the time they freeze, they’ll be really mushy and kind of gross. Porter likes these fake bacon things so I tossed a few of those into the bowl. Speaking of bowls, you can use any freezer-safe bowl to make these blocks. I used a large measuring cup, but you could definitely just use mixing bowl or something. Make layers of treats and water/broth so the treats are distributed throughout the whole block. Here’s my first layer of bacon and water frozen almost solid. One fun step that I like to do is add a thin layer of peanut butter. This freezes and as it melts it runs down the sides – dogs love it. Just keep stacking on treats and broth or water until your bowl is filled! I did about four layers, but you could do as many or as few as you want, really. Getting the block out isn’t too hard. The best way to do it is just to let it thaw on the counter for 10 minutes. Then it should just slide right out. You can run the dish under hot water to make the block release faster, but don’t do this if you freeze it in a glass container! The glass container could shatter from the hot/cold temperature difference. Porter was a bit skeptical of this thing the first time I set it out so I just smeared a small dab of peanut butter on it. Once he got the idea that it was a) cold and b) filled with wonderful treats, he was all about it! I wouldn’t recommend letting your dog just lick this until it’s gone. I let Porter lick on it for 15-20 minutes and then I’ll take it away and re-freeze it for a bit. It’s a lot of liquid and treats, so it’s probably best to ration it. Make one of these for your furry friend and he/she will love you even more than they do now… if that’s possible! Nick didn’t try even a single lick of this treat. Be sure to check out his blog, Macheesmo, his book, Cornerstone Cooking, and check out his Tablespoon profile.